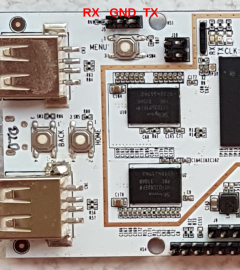 The LinkSprite pcDuino is an A10 based development board with Arduino compatible headers. For building u-boot, use the "pcDuino" target. Use the Linksprite_pcDuino_defconfig build target. Use the sun4i-a10-pcduino.dts device-tree file for the mainline kernel. The RX, TX, and GND pins are located near the MENU button as shown in tthe picture. Just attach some leads according to our UART Howto. This page was last modified on 8 December 2018, at 04:47.